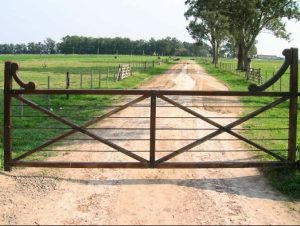 The Code of Rural Gate Etiquette Range Wars | RANGEfire! In the West, there is the well-known saying that “Good Fences Make Good Neighbors.” But regardless of the condition of a fence, it doesn’t do much good if someone doesn’t close the gate. The Code of Rural Gate Etiquette is really more a matter of ethics. This piece explores the consequences of gate etiquette and ethics. This subject is especially relevant in light of the Jack Yantis Tragedy. Editor’s Note: RANGEFIRE! 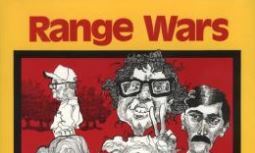 is going to start posting, from time to time, a series of short stories called “Range Wars & Legal Tales” by Mancos MacLeod. How much of each story is actually true is for you to decide. Unlike doctors and veterinarians, lawyers aren’t supposed to get calls in the middle of the night, but I got this one in the wee hours of the morning. My client was a rancher, and a friend. I’ll call him Joe. 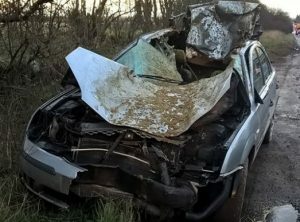 One of his best horses had been hit and killed on the highway. Unfortunately, there’s a lot more to this story. If a cow gets hit by a car or truck it can do a lot of damage to the vehicle. But if a horse gets hit, especially by a car, it can often pose a lot more danger to the occupants of the vehicle. Because of their longer legs, horses have a higher center of gravity, and instead of just taking out an engine or totaling a vehicle, like cows often do, it is not uncommon for a horse to come right through the windshield and land in a person’s lap — which is often a much more dangerous situation. Unfortunately, that is what happened in this case, and the driver was killed. She was a young mother, returning home in the middle of the night from a trip to visit her parents. She hit the dark horse so hard it is unlikely she ever saw it. But like I said, there’s more to the story. 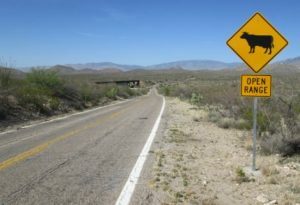 In the hinterlands of the West, livestock out on the highway are not uncommon, and much of the West is considered “Open Range,” whether there are fences and gates or or not. People have really got to make you wonder some times. I had another rancher friend who had some horses get out on the highway at night. One was hit by a car, but no one was injured, and the local sheriff’s department was quick to respond. Based on the accident, there were two sheriff’s department vehicles parked on each side of the highway, with their flashing red and blues. You would think that would be enough to get people’s attention and cause them to slow down and proceed with caution. But not in that case. Despite the flashing lights, before they could get the horses off the highway, two more cars hit horses. People do have to make you wonder sometimes. The problem in the first case, where the young mother was killed, was that someone had intentionally left the gate open, allowing the horses in question to escape out onto the highway. Now for the rest of the story. And people do really have to make you wonder some times. My rancher friend, Joe, had a new neighbor. They shared a driveway. The neighbor was a recently retired building inspector from a metropolitan area who wanted to move to the country. Unfortunately, he felt like he already knew everything, and was used to pushing people around and getting away with it, and he didn’t care about anyone but himself. One of the first things he had done was trespass onto my rancher client’s property, knock a hole in his irrigation pipeline, and hook in to it. When my rancher friend discovered and became upset about what he had done, all the sudden he (the rancher) was now the bad guy. Out of spite, the neighbor started always leaving the gate open, hoping livestock would escape from Joe’s pasture, just to cause Joe problems. Q: Tell me what was said. A: Mr. B stated that he would leave the gate open if he wanted to, and that just because there’s a sign on the gate doesn’t mean that he has to close it, and there’s nothing that I could do to make him close that gate. He said he was going to do what he wanted to do. A: I referred him to the law. Utah Code Section 41-6-38, regarding Livestock on a Highway. I told him that it’s against Utah law for livestock to be allowed on a highway unattended, and that he, by leaving that gate open, takes control over that livestock, and therefore could be responsible if the livestock enter the highway. That was my approach. I told him to please shut the gate. But he again said, he was not going to shut the gate and I could not make him do so. Q: Did he explain what he was thinking? A: I was so stunned at his reaction and responses that I backed up and tried to start exploring his motives and what he could possibly be thinking to be willing to be so reckless in endangering both people and animals by intentionally leaving the gate open. A: He even admitted that it wasn’t just a matter of leaving the gate open when he went through. He said that in the evening, if the gate was shut, he would often walk out from his house, open the gate and leave it open just out of spite. Q: In fact, Mr. B made such an impression on you that you put his response in Q: Yeah, in fact that made such an impression on you in your report that you put his response in all caps, “YES, I WILL LEAVE THE GATE OPEN, AND I DO IT JUST OUT OF SPITE,” correct? The deputy went on to testify that he had been called on the same issue on at least three different occasions; that Mr. B had argued with him about the law and accused him of providing an incorrect code reference, and again refused to keep the gate closed. The deputy testified that ultimately he issued Mr. B a citation for leaving the gate open, based on evidence he had received in the form of trail cam photos and videos showing that even when the gate was closed, Mr. B. would walk out from his house, open the gate, and leave it open for no reason. Based on the evidence, there is no question that Mr. B was tempting fate. When I got the call from Joe in the middle of the night, he was beyond grief-stricken. Not only had one of his best horses been killed, but a young mother had lost her life, all because of the ill-will and intentional recklessness of his neighbor. I told him I would be right there. He was so enraged that it ended up being all I could do to stop him from going into his neighbor’s house and tearing him from stem to stern. And it was all I could do to stop myself from helping him, knowing that ultimate accountability would be anything but swift and sure in what I had come to refer to as the “so-called justice system.” But also knowing that Mr. B would have undoubtedly deserved anything we might do, if we took matters into our own hands to extract justice and revenge, we would be no better than he was. This was something he would have to live with the rest of his life — and so would we. Moral of the Story: If you’re going to live or operate, travel and spend time in rural areas of the West, please show some respect and honor the code of etiquette that applies. 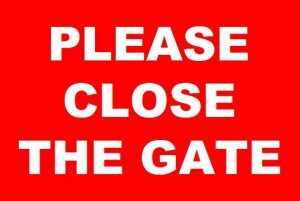 Although it may seem like a small thing, there can be serious consequences for failing to leave a gate as you found it.